The passage from Samoa to Tuvalu forecast looked promising, last of the southeast trade winds, 10 – 15 knots just aft of the beam, less than 2 meter waves, not too many rain squalls. All was mostly pleasant, a little lighter winds than forecasted the first 5 days but the waves were coming from all directions creating volcano shaped waves and most of it was 2 meters and built to 3 at times. We rocked and rolled in light winds, our appetites were squelched but it was too rolly to attempt cooking anyway. We reminded ourselves that the rain squalls were holding off, it was hot but under the bimini we felt comfortable enough to sit and read, and the sails were staying full most of the time. We hoisted Mr. Bean (whisker pole) off to port attached to the full yankee and with one reef in the main we sailed for 2 full days. A pod of frolicking, jumping dolphins joined us, we haven’t seen dolphins since the crossing from Mexico. A sign of heading north perhaps? The nearly full moon kept us company, the ocean had a beautiful shimmer all night, the stars barely shone. Lovely sailing despite the rolling seas. 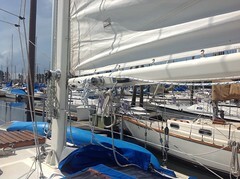 The third day out, all was well until we heard a “twang” near the mast, metal to metal clinking. Oh crap, nothing too serious? – the spreader lift wire broke off the spreader, we could see the fitting still attached to the end of the wire. That was a problem though. It was swaying back and forth at times violently, repeatedly smacking our snazzy painted mast. 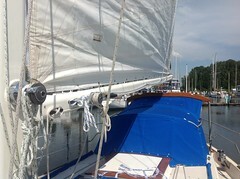 We cringed with every irritating smack knowing we were losing chips of paint and suffering little dings in the mast. I begged John to hoist me up to the spreader just to grab it and tape it to the mast to prevent further damage. Quick as a Saipanese monkey I’d be, but he vehemently denied my request. There was no going up the mast in the rolling conditions. We counted how many more days of clanging and dents. Grrrr! 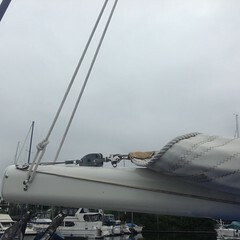 John was able to take the spare halyard (rope) captured and secured it to the mast for a couple of days. Much to our chagrin he had to repeat the roundup a few times. A job for the anchorage when we arrived in Funafuti. We hoped for a 5 day sail but the winds just didn’t fill in enough to get us into the atoll during daylight hours. The last day out the squalls came on us with a vengeance. We knew we would heave-to and wait out the remaining 8 hours just 40 miles south of Funafuti. With no choice but to wait it out, the seas and wind picked up with no regard to our comfort! We had 35 knot winds all at once. John had just finished tying the spray skirts on when a huge wave broke alongside the cockpit sending a wall of water through the railing and over the bimini. Fortunately I had just gotten down below and closed the cabin doors. We watched 12 foot waves breaking around us and the wind was shrieking through the rigging. We sat down below and waited, and waited, counting the hours as we rolled and pitched making us both queasy. At midnight we woke, let loose the sails and sailed to Funafuti. The waves were too much for the south pass, the breakers on the reef would’ve been too dangerous to cross. We continued on with the engine with light northerly winds to the west pass, narrow, and about 2 miles of reefs and shoals. Using google earth charts – satellite images of the area provides a picture of where our boat is using gps coordinates in relation to the reefs and pass overlayed onto CM93 charts on the laptop. A little more complex than this brief description but overall, another way of entering a pass in addition to other charting applications we use. Of course eyeballs and vigilant watch is most important. Oh and when we arrived – it was calm, clear water! We anchored in flat bottom 40 feet, tidied the boat, zipped on the sun covers, and with abundant water supply had the laundry on the lifelines before noon. We gave our ritual high-five, hugged and gave our thanks for a good, safe passage. By far this was a nice sailing passage aside from the ongoing rolling. We sailed all but the exit from Samoa and the entry through the pass. 5 days of good sailing, 1 lousy day of horrendous winds, rain and giant breaking waves, only 1.7 hours motoring out of Samoa reefs and 3.7 hours on the lee side of Funafuti and through the pass to anchorage. Sweet! There were 2 Aussie yachts but departed in the afternoon. We briefly chatted, got the cruisers’ info on Customs and Immigrations, wifi, lay of the land. They are also headed north to Kiribati, we’ll be looking forward to meeting up with them there as well as moving across Micronesia. It’s a ways off yet but we’ve missed having cruising buddies so we’re keeping our hopes up. We’ve had the anchorage all to ourselves for the last 2 weeks. Time flies! Funafuti is truly a remote south pacific island. The island is one of nine islands – formerly known as the Ellice Island group. The island is about 9 miles long, perhaps ½ mile across. There is 1 road running North to South. The main attraction is the 3 story Government building – the roof lined with massive solar panels offering air conditioning and nice seats to hang out while people watching. Twice a week a small passenger plane arrives from Fiji. The 40 year old fire truck winds up the old WWII siren 30 minutes before the plane arrives and drives up and down the runway. The warning signal for everybody to clear off. Mopeds, bikes, dogs, kids are trained to move along quickly. People line up near the runway waiting for the plane’s arrival. We participated in the departing lineup, waving as the plane roared down the runway less than a block from our standing position. They get all excited waving goodbye, cheer and greet one another. The simple life here. We were amazed by the beautiful white beaches, pink sand of ground coral and blue water. Lots of beautiful shelling and beach walking. It’s hot during the day but the evenings are cooled with a NE breeze, enough that we sleep comfortably. No bugs, no distant shore and traffic noise. There are very few cars here, mostly mopeds loaded with kids, groceries, drivers, miscellaneous goods. During the down pours they hold umbrellas over their heads as they scoot down the narrow “highway”. Had a couple of close calls stepping out in front of them as the flow of traffic is opposite to the U.S. and didn’t see them coming around a corner. The people are not Samoan, not Fijian, not white either. Besides the general 2 arms and legs, they have a very dark complexion, most of them tall and slender. Their faces are long and narrow, beautiful black eyes, jet black hair. Their language is some form of Polynesian and limited English. The kids can recite grammatically correct English salutations, etc. but cannot converse fluently. Some of the adults can communicate but again, it’s limited. Don’t bother asking for directions to the market. The kids are very nice and sociable, they want attention and often call out to us. Wifi is terrible. Slow and very expensive. $16 US for 600Mb, barely fast enough to download some weather files, post a small blog and a couple of emails. Hence no pictures on this blog, sorry. The food is very basic – fish and rice. The grocery stores are tiny and barely stocked with canned goods, mostly from Fiji. There was a line up at the grocery store the other day. Apparently the ship came in and this week’s special was sugar. People had 30 pound sacks, there were 2 guys carrying 100 pounds of sugar out the door. There are no fresh produce stands, a few banana trees, lots of coconut trees and some breadfruit trees. Limited soil and space not much is grown here. We bought a loaf of local bread, a fluffy white blob that resembles a holey sponge. And since it’s too hot to bake on the boat we’ve made do with the strange textured, sweet rubbery sponge. I purchased 4 carrots imported from Fiji, they turned black and wilted in the fridge the next day. There are a few dogs, no cats, few birds, didn’t see any rats or cockroaches. Other than viewing the simple homes with very large cisterns capturing water, there is very little else to distract watching the people. And that’s what makes this place special, a step back in time, away from the western culture, family oriented and mostly simple. Most of the people depend on the fishing industry. There are 6 large fish processing ships currently in the harbor. The fishing trawlers go out –netting of course – and return side tying to the mother ships. The full canning process is done in the harbor. A couple days ago a fishing panga came by with father and two sons. They had a boat load of frozen Travelly jack, Rainbow runner, and frozen yellowfin tuna. The large fishing trawler had arrived earlier and regularly give fish to the locals. We gave them Aussie $10/ $8 US and a jar of mayonnaise for 2 medium sized fish. The fish eyes were still bright – indication of instant freezing, wonderfully fresh and delicious! We’ve enjoyed our stay here, it’s been lovely sitting in the calm waters. Out of 14 days, we had 3 days of rain squalls. It came down so hard that the island about 1/4 mile away and the large floating fish plants all disappeared. We captured lots of rain water, showered on deck, washed 3 big loads of laundry, cleaned the canvas, filled our tanks and every available jug on the boat. During the full sun days our 300 watts of solar panels kept up very well. We cranked the refrigerator and made plenty of ice, powered the radio and radar, charged the computers, electric toothbrushes, vacuum cleaner, e-readers, etc, ran full fans during the day and were able to get through the night. We learned our lesson – don’t buy the cheap flexible panels – waste of money. 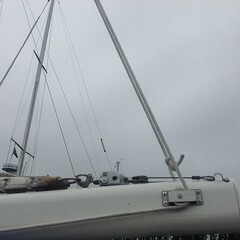 John repaired the spreader lift wire, redid the port side just in case, and checked all rigging at the top of the mast. We’ve cleaned the boat inside, scrubbed the bottom and rudder – well John did anyway, and now ready to leave in the next couple of days. Our next journey is another long ride, the winds look light, especially as we approach the equator. 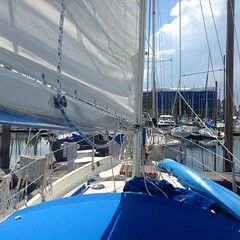 Doldrums here we come, hopefully without the squalls and crazy winds. We say goodbye to the south Pacific, a little saddened to depart, seems like we just got here but the cyclone season will start soon and we need to be well north. Wish us fair winds, no following seas though – makes us queasy. It was a quick 16 hour motor out of American Samoa on calm Sunday night, September 25th. The winds didn’t fill in as forecasted, and the squall line in the distance provided a nice light show; fortunately the cloud to water lightning bolts were moving away from us. We crossed the date line and arrived on Tuesday, Sept. 27th, famished, hot, thirsty, and pooped with little sleep. The marina turned out to be very nice, almost like home with concrete docks, firm holding cleats, potable water, and a row of restaurants across the street. I went to the top of the dock ramp where the very helpful taxi drivers wait for tourists. Tsukee, the driver pointed out a nice restaurant so ignoring that we hadn’t even checked in with Customs and Immigration, I dashed across, ordered a fish and chips and asked Tsukee to deliver it to the boat. The marina manager and Customs officials are pretty relaxed here. It was great to have all of the officials come to the boat for a change, we didn’t have to figure anything out and best of all, we just relaxed in the cockpit. The first obvious difference is the traffic driving on the opposite side of the road, and stop lights (there were no stop lights in Am Sam), crosswalks, noise and congestion, with tourists everywhere – mostly New Zealanders and Australians. This is the cheap tourist destination for those countries. The big cruise liners come in once a week and the city is inundated with camera toting tourists. And wearing appalling short shorts, tank tops, and bright white legs. Here the cars have the right of way, and when you’re not thinking of the opposite flow of traffic it’s dangerous to try and cross the busy street without looking several times. The drivers would just as soon run you down, tagging extra points for the Pelangees. Dogs run wild and one crew member off a neighboring boat was bitten. John had to fight off one vicious dog with his backpack. Next time we’ll carry some rocks. 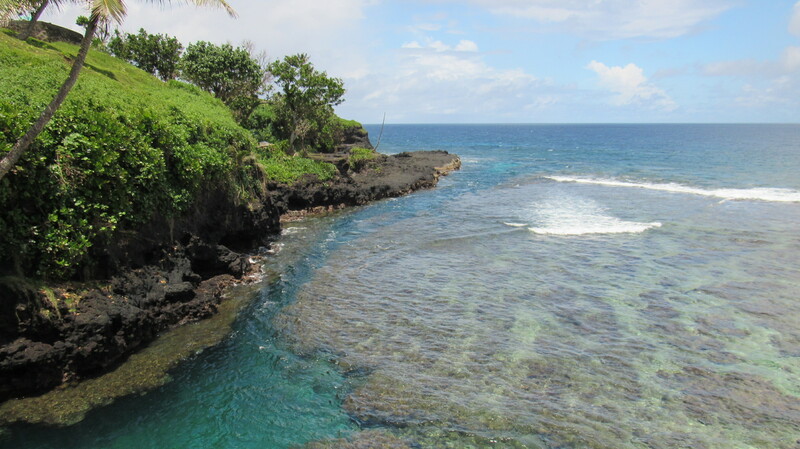 Once out of the noise and traffic, Samoa is exquisite and peaceful. The air is clean and fresh, the harbor water is clean. The culture here is different from American Samoa even though the citizens of both countries share the same language and religious beliefs. The Samoans are industrious. There are coffee and cocoa plantations, farms with cows and sheep, partly due to the size of Samoa and green lush flatlands. But the streets are cleaner too, the people are much more active – thereby much less rotund, and much more outgoing. The villagers take a lot of pride in their homes and work hard to present a beautified village. Each home has a “pavilion” or family gathering place where family and guests are welcomed. Pavillions are open on all sides, ornate, colorful, draped in Samoan prints, maybe they’re concrete, some are wood, some are actually lived in, and some are grass huts. There are stone base pavilions that have been in the family for generations, lichen covered boulders were amazing. All unique and inviting. The Matatua village chief, Tusi Tuatua nickname “Junior” our driver took us on an island tour. We started the day at the Robert Louis Stevenson mansion/museum. His tomb is at the top of the mountain, a 1.5 mile hike up the hillside. The Samoans revere him, they sing his poem in their Sunday church services. A very beautiful home – Vila Vailima, most of it has been refurbished due to the high humidity and salt air. However there are quite a few original bedroom furniture pieces, his writing box and inks, books in glass cases, and California redwood paneling. We continued on to the high waterfalls, lower falls flowing into swimming pools carved into the bedrock, and along the coastline collapsed lava tubes nearly 100’ deep have been turned into swimming pools with a slippery, moss covered ladder leading down to a platform over the water named the “sea trench”. 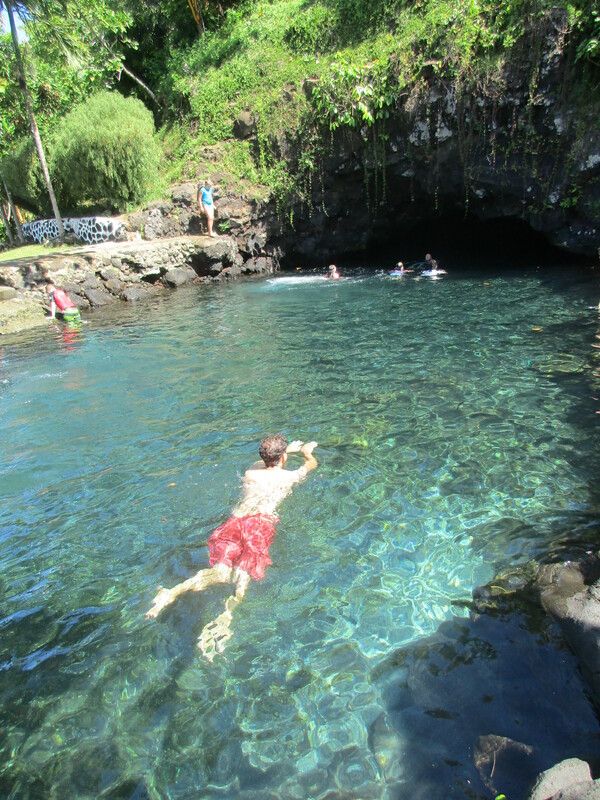 There were several other lava tube pools along the seaside where fresh water flows from the high mountains. There are spectacular, fine white sand beaches, rocky cliffs, rough flowing black lava cliffs and bedrock. John swam in all the fresh and sea water t ide pools; clear, emerald green ocean with deep blue trenches, breathtaking views from the cool refreshing mountain tops when not draped with fast moving clouds. We picked a cocoa pod and ate the green pith around the cocoa bean. It was a citrus flavor with a sweet note. Cocoa, coconut, banana, papaya, and mango trees are along the roadside, begging to be plucked. We’ve been very fortunate, most of our weather has been tolerable. The rain has moved in the last couple of days and the temperature feels like it’s 95 degrees in the boat. Somewhere around 2:00 a.m. it finally cools enough to sleep. We provisioned heavily while in Am Samoa so we aren’t in need of anything but fresh fruits and veggies. Things are a little more expensive here. The fruits and veggies are nicer here with more variety. A 3# bag of eggplant costs about $1.25. Mangoes are in season with several varieties and so sweet. The pineapples and papayas are juicy and wonderful. We purchased a small bag of fresh bitter cocoa, ready to grate for baking or to drink in the coffee. Also a fresh bag of cocoa beans ready to roast and eat as you would almonds. The flavor is indescribable. As to greens – well the hot weather isn’t great for growing greens and we miss the green salads of home. We didn’t bother figuring out the bus system, the bus stops aren’t marked and not sure where they’re located. The taxis are very cheap, $5 tala – about $2 US will take you anywhere. But as in American Samoa, each stop will cost $5 tala for each stop. We walk a lot of miles, we’re getting even thinner. My elbows have healed well enough, I no longer wear elbow braces and as long as I don’t carry, lift, push and pull, or strain in any fashion – I’ll make it. Good thing John is strong and able-bodied, mm-hmm. In case you’re wondering, somehow I developed tendonitis in both elbows back in Am Sam and wore elbow braces for nearly 3 weeks. I couldn’t lift even a pan without intense pain. Daily doses of Advil and splashes of Gin lessened the pain at night. We were set to leave a week ago but a big low depression developed north of Fiji driving 45 knot winds and steep seas. We calculated our trip northward and the last 200 miles forecasted into Tuvalu would’ve been plowing through 15 – 20 knot northerlies with 6-8’ washboard chop, a repeat of our trip from Bora Bora to Suwarrow back in July. No, thank you very much. So we’re looking at the weather for a 6 day trip – 630 miles, so far it’s looking like the next couple of days we’ll be heading out. Cross our fingers the SPCZ (South Pacific Convergence Zone) – stays quiet and well south of us allowing the East tradewinds to fill in. And, while we’re asking the Weather Gods/Neptune, can we have no squalls with lightning? Follow us as we head north to Tuvalu, you can watch our progress on the DeLorme tracker and we post daily comments. We try to say nice things, never curse, and laugh to appease the Weather Gods.